Coves' debut album Soft Friday was number 3 in Even The Stars' albums of 2014. They've followed it up with some exhilarating live shows earlier this year and now release a four-track EP, for free, which includes three new tracks as well as a reworking of album No Ladder. On this basis, Coves retain their ability to thrill with a darker electronic sound and the breathless angelic vocals of Bec Wood. Opening track Shot To The World was revealed ahead of those live shows and is a great introduction to the uninitiated to Coves' sound as it leaps round from idea to idea, all spilling from the musical whirlwind that is John Ridgard's creative mind, yet still forming a coherent distinct sound. Squalling treated guitar sounds merge with the electronic backing before Bec's vocals come back in. It's a progression from Soft Friday without turning its back on what they've done before. No Looking Back takes its feet off the gas a little, giving Bec a bit more time to breathe and allows her to demonstrate the range of her voice in a way she hasn't had much opportunity to do so far in Coves' short career as she's had to fight her way through the electro-savagery of some of their finest moments. 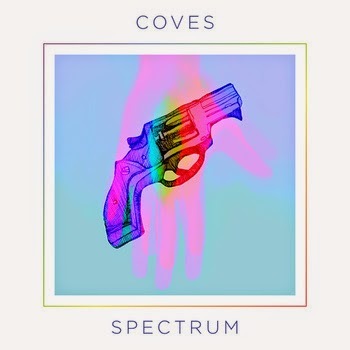 This new found serenity in Coves' approach doesn't last to the end though as guitars kick in with about a minute left and take the song off at a tangent before returning to base at the very end. Third track Twisted takes a similar path, albeit with a electronic beat that dances around Bec's vocals like some form of demented stalker staggering around its prey. It makes the track fabulously unnerving, leaving the listener uncertain of just quite where it's going to go next. They revisit one of the stand-out tracks on Soft Friday, No Ladder, to close the EP. It's stripped back and stretched out to over five and a half minutes with Bec's vocals slowed down and treated with slightly distortive effects in parts. It demonstrates that under the full-on approach of most of their recorded output so far there's some great songs under there that stand the real test of being able to be reinterpreted, revamped and reassessed without losing anything that made them special in the first place. Coves are the older and wiser siblings of the likes of Chvrches and London Grammar, not afraid to venture down the darker unlit paths their younger compadres refuse to tread. The musical chemistry between Bec and John is evident in each and every song. Coves should be absolutely huge, but that'd probably mean them having to play it safe and they are everything but that. Spectrum is now available as a free download on their Bandcamp page. Soft Friday can, and should, be purchased from here. Coves' official website can be found here. They are also on Facebook and Twitter.